"From the Four Noble Truths to the Four Universal Vows" is the latest of Venerable Grand Master Hsing Yun's erudite writings in Chinese to be made available in a lucid, readable English translation. Its subtitle "An Integration of the Mahayana and Theravada Schools" illustrates the prime objective of the learned writer's on-going effort to harmonize the teachings and the practices of different schools of Buddhism. He stands out as the most influential reconciler and bridge- builder among schools, sects and traditions of Buddhism and his magnificent interpretation of Humanistic Buddhism is hailed as an effective umbrella concept to unify the Buddhist world for the application of the teachings of the Buddha for the well-being of humanity here and today. This short treatise is a masterful presentation. The Grand Mater displays his deep and wide-ranging scholarship by drawing on a board spectrum of Buddhist literature spanning the Pali Canon of Southern Buddhism, its counterpart in the Agama Sutras of the Chinese Tripitaka, the great Mahayana Sutras, and a variety of Sanskrit and Chinese treatises of specific Buddhist schools. Few scholars in the world can match the Grand Master's command of this vast literature or the facility with which he delves into them for appropriate quotes in support of his splendid appreciation of the relevance of Buddhism to life. The Four Noble Truths, according to all Buddhist traditions, represent the very first formulation of Sakyamuni Buddha's world-view and path of salvation. 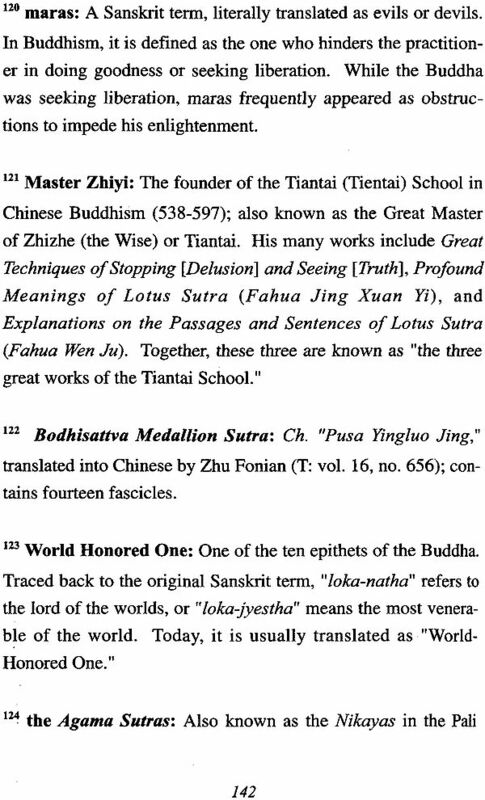 As the Grand Master has stressed several times in this book, all teachings and practices of all schools of Buddhism emanate from the Four Noble Truths and are founded on them. He has rightly chosen this most fundamental of the Buddha's teachings to re-emphasize the harmony which prevails in all forms of Buddhism at the highest level of their doctrinal identity. 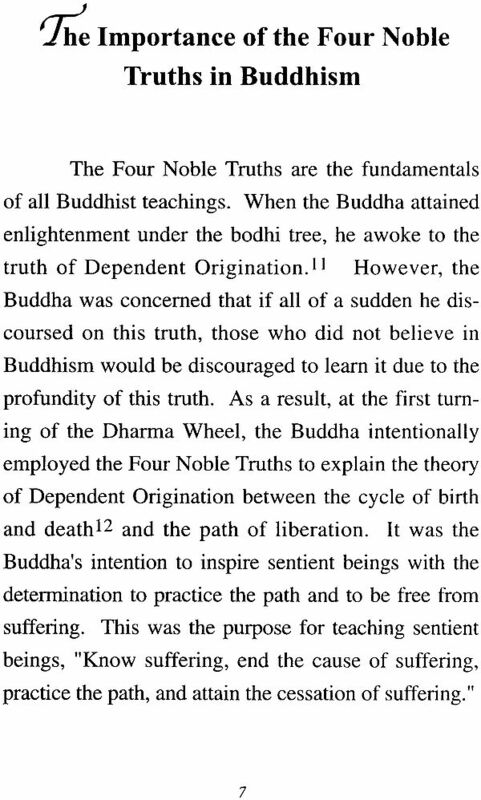 Nothing establishes the unity of Buddhism more convincingly than the common acceptance of the Four Noble Truths as the fountainhead of all Buddhist doctrines. How effectively the Grand Master has demonstrated this truth by quoting from principal scriptures of every Buddhist tradition! The Grand Master is an impeccable researcher. He has put together the various formulations of the Four Mahayana Vows according to different sutras and sastras. Here again, he demonstrates the commonality which pervades Buddhism. Tathagatas are infinite, I vow to serve them. Buddhahood is supreme, I vow to obtain it. Rely on unconditioned dharmas, not on conditioned dharmas. He equated learning with practice but would emphasize understanding and self-reliance. "In reality", the Grand Master tells us, "Buddhahood is not impossible to achieve! If, from understanding the Four Noble Truths to the fulfillment of the Four Universal Vows, we are able to inspire and make vows in accordance with the Dharma, practice diligently without indolence, and accumulate blessings, virtues, and good conditions, then Buddhahood is within our reach." I have read this book with profit. It is a must for those who value Buddhism for its perennial applicability to life. It is a must for those who seek evidence of the remarkable unity within the diversity of Buddhism. It is a must for all who share in the Grand Master's lofty thoughts and timely guidance. The Four Noble Truths that the Buddha awakened to are the universal truth of suffering, the cause of suffering, the cessation of suffering, and the path leading to the cessation of suffering. From these Four Noble Truths, numerous Buddhist teachings were developed. Even so, on the basis of this universal truth, the Buddha intentionally developed and categorized these teachings into different levels of doctrines for the benefit of Buddhist practitioners. Subsequently, through the integration with everyday life, the Four Universal Vows emerged. The following is a brief illustration of the association between the Four Universal Vows and the Four Noble Truths. The truth of suffering refers to the suffering of sentient beings; hence, the necessity of making the vow, "Sentient beings are infinite, I vow to liberate them." The truth of the cause of suffering implicates that suffering is the result of the accumulation of karma; thus, the need for making the vow, "Afflictions are infinite, I vow to eradicate them." 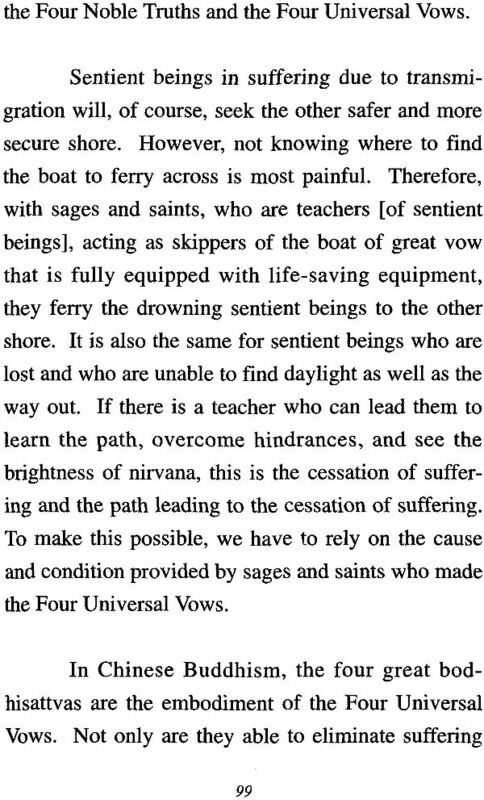 The truth of the path leading to the cessation of suffering is to reinforce sentient beings to further practice the Path; hence, the importance of making the vow, "Dharmas are inexhaustible, I vow to study them." Lastly, the truth of the cessation of suffering marks the potential for every sentient being to attain Buddhahood; resulting in the vow, "Buddhahood is supreme, I vow to obtain it." Thus is the path, which is practicable. Thus is the path, you should practice. Thus is the path, I have practiced. From the aforementioned, it can be suggested that the first two Noble Truths are the cause and effect in the mundane world. While the cause of suffering is the origin, suffering is the result. 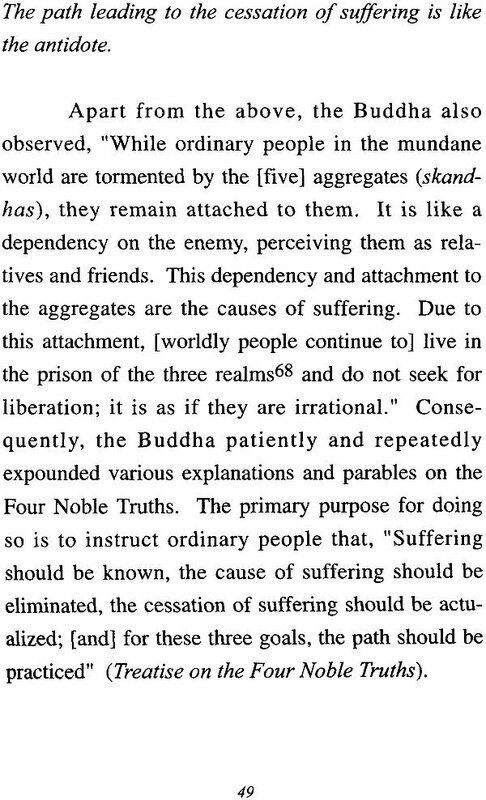 The same is applied to the last two Noble Truths as the cause and effect in the supramundane world. 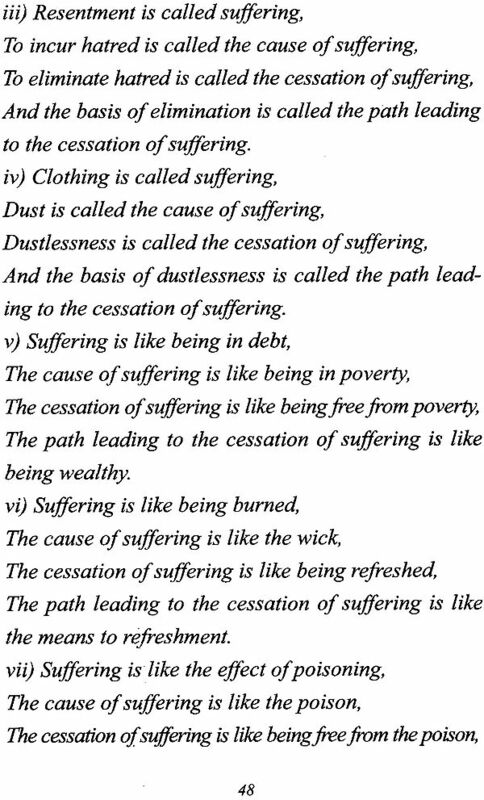 While the path is the cause, the cessation of suffering is the effect. 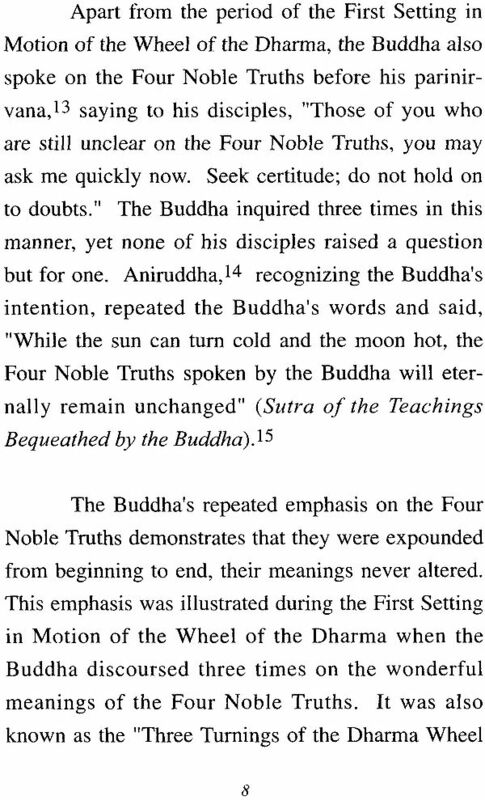 The Four Noble Truths may be a common topic of discussion among Buddhists. However, to fulfill them, we must proceed through the "way of vowing" of the Four Universal Vows prior to the "way of practicing," with the latter consisting of the six perfections that embody the bodhisattva path. It short, it can also be deduced that the Four Universal Vows of Mahayana Buddhism are the developments of practice based on the teachings of the Four Noble Truths originally discoursed by the Buddha. This is also a process through which Buddhism has been able to become a multi-faceted religion. From the dharmas of the Four Noble Truths to the actualization of the Four Universal Vows, it is also evident that the Buddha's teachings are characterized by a sense of contemporariness, continuity, and progress. His teachings are systematically inter- connected, and therefore, have enabled the Dharma to withstand through history, time, and space. Furthermore, contrary to the belief of many that the Mahayana and Theravada are of separate teachings, they are in fact very much integrated, of one and not two. Thus, it is the primary objective of this paper to demonstrate the existence of this integration.